Hi anybody that have been trying Welles Wilder Deltha Phenomen discovered by Jim sloman ? basically its based on interation between earth and moon..
Hi anybody that have been trying Welles Wilder Deltha Phenomen discovered by Jim sloman ? basically its based on interation between earth and moon..
ninja did you read that book ? The delta phenomen or hiddden order in all markets. theres no one on here that could even think of trading the delta method. I havent heard Jim Sloman but I read some articles from Tom Hougaard. Graph looks very interesting and something original anyone with any idea? Yep that is exactly Deltha Phenomen. in that article they are mention also Jim Solman. i am attaching extracted orginal image from book with colored lines. I had this book (and got rid of it). It's been around for a long time, I must have purchased it over 15 years ago. Forget it. It's just a lot of hoakum and does not work. But nice solution for total demoralized and frustrated traders. If still bad then bad moon. so some truth can be behind it. 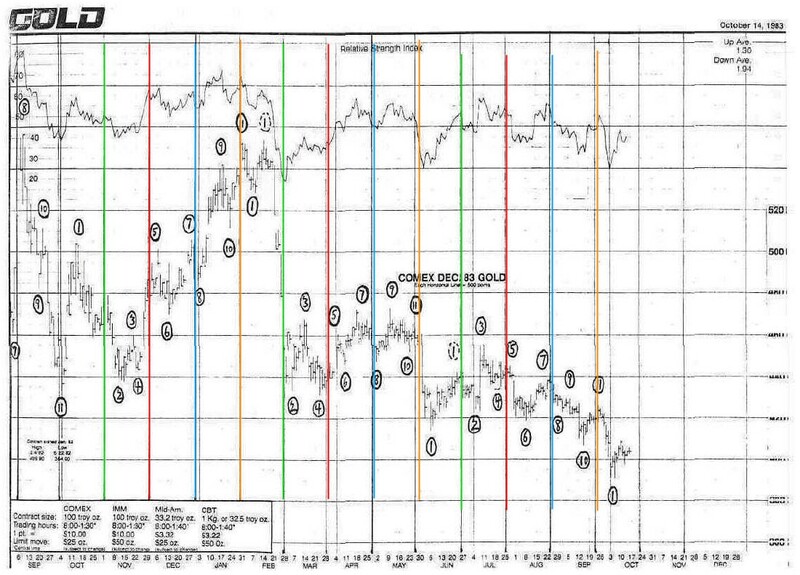 what about big traders like gann he also mention about astro cycles. also some others. so something will be on interation between planets. it was all about joining the secret Delta society which back then did cost hundreds of dollars. Without joining members of Delta society, there was no way to actually learn something from this package. Great reading but that's about that. I've never got in to it any further because I was not interested in joining. Thanks for bringing up some of the first trading interest memories. ''It is designed to teach the user how you use time as the most important tool in your trading decisions. Calculating price targets actually comes second to time. This is not a new theme. Gann made the same assumption. I have lost count the amount of times Copan has said to me "Time is the most important tool". ''The foundation that is used in the Matrix is Fibonacci numbers, extensions of Fibonacci, and ratios of Fibonacci. It is used in conjunction with Delta turning points and the aim of course is to pinpoint turns in the markets. The Matrix can be used for intra-day trading, swing trading and longer term position trading. In my experience the hardest bit to master is the intra-day trading, while trading over a couple of days is more straight forward. I can't see any astrology-stars type of info,also anyone has an idea about Steve Copan's trading style?